Who are “Friends of the Barnes Foundation” ? Friends of the Barnes Foundation is a citizens’ group dedicated to educating the public about the unique legacy and mission of the Barnes Foundation, and to supporting efforts to maintain the permanent collection and the educational programs in their original home. The Friends believe that the proposed relocation of the Foundation would do irreparable harm, and that its present financial difficulties can be solved, its integrity preserved, and the public interest served, by available alternatives. To find workable solutions, Friends of the Barnes Foundation members did extensive research, met with local public officials, neighbors of the Foundation, educators, and museum consultants. This resulted in a proposal for positive change at the Barnes Foundation that recommends increased access to visitors and increased revenues to support a secure financial base for the institution. For more information about this proposal, please see Sensible Solutions. Friends of the Barnes Foundation began its activities in late 2004. 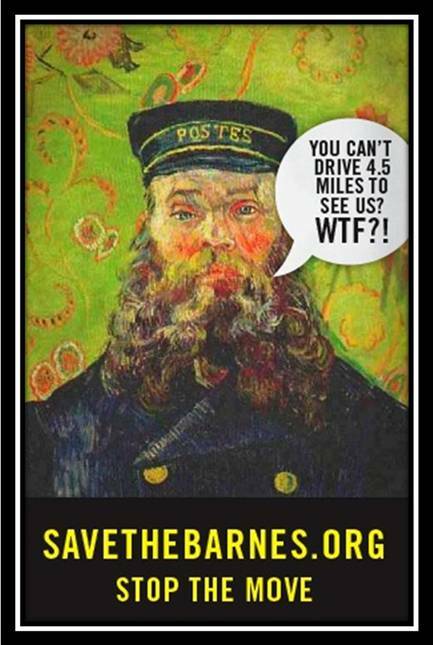 The group formed shortly after the ruling of the Montgomery County Orphan’s Court granting permission for - but not mandating - the Board of Trustees of the Barnes Foundation to move the institution’s art collection to the city of Philadelphia. • Development of detailed alternative plans that embrace a permanent home for an intact Barnes Foundation in Merion. See Positive Solutions for Change. • Building a thriving, growing organization from a fledgling group of 15 to a group of over 5,000 members from around the country and abroad. • Discovery of a previously unknown $100 million state appropriation for construction of a building in Philadelphia to house the “Barnes art collection” in a 2002 Pennsylvania Senate Capital Spending Bill. This action took place more than two years prior to the court ruling permitting the move. The court did not know of the appropriation at the time of its decision. • Promotion of the complete story among writers from national and local publications. National media figures, such as Christopher Knight of the Los Angeles Times, Lee Rosenbaum of the New York Times and CultureGrrl blog, Ada Louise Huxtable of the Wall Street Journal, and Richard Lacayo of TIME Magazine, among others have denounced the folly of the proposed move. A local publication, The Main Line Times, publishes our weekly essays called The Barnes Files. • In June 2006, we held a major public awareness forum where a standing-room only audience gathered to hear national figures speak about topics related to the threatened move of the Barnes. • We have consulted with our U.S. Congressman, Jim Gerlach, as he explores legislation that employs the Internal Revenue Code and other avenues to thwart the move of the art collection. • We have met with representatives of the Attorney General of the State of Pennsylvania to review “changed circumstances” of the Barnes Foundation in Merion. We have repeatedly requested that the Attorney General exercise his duty as parens patriae to protect the Foundation. • We have received support and assistance from all local civic organizations. • We have received official statements of support from our state representatives, Montgomery County Commissioners, and Lower Merion Township Commissioners. • We have commissioned a review of the court decision allowing the move. Preliminary findings of that review indicate that the outcome reflected a total failure of due process as a result of the deliberate lack of participation by the Pennsylvania Attorney General, an unwillingness of the Barnes Foundation to consider alternatives available to them, the conflicts posed by an outside organization paying the legal fees of the Foundation board, and the limited ability of students to participate in the case. We are encouraged by the ever-expanding support of our mission. Friends of the Barnes Foundation will continue to inform and engage the public, the media, and public officials about the issues. In order to do so, we will need financial support.